Precise numerical analysis may be defined as the study of computer methods for solving mathematical problems either exactly or to prescribed accuracy. 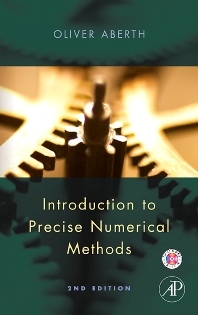 This book explains how precise numerical analysis is constructed. The book also provides exercises which illustrate points from the text and references for the methods presented. solving partial differential equations with the included software and computing line integrals in the complex plane. Oliver Aberth received his B.S. from City College of New York, his M.S. from Massachusetts Institute of Technology, and his Ph.D. from the University of Pennsylvania. He is also the author of Computable Analysis (McGraw-Hill, 1980) and Precise Numerical Methods Using C++ (Academic Press, 1998). He was professor of mathematics at Texas A & M University from 1970 to 1999. He is currently professor emeritus at Texas A & M University. Texas A & M University, College Station, U.S.A.